If you're not moving forward you're doing it wrong. That's the philosophy that launched Inertia: Escape Velocity from its humble beginnings as an Xbox Indie student project to a full-featured mobile game for Android and iOS devices. It's also the strategy you'll need to employ to advance through the games 35 plus levels of off-the-wall physics platforming. You play as Hermes, a high-tech scavenger scouring derelict ships and alien ruins for the scrap needed to continue his search for more scrap. Hermes doesn't need your approval. Hermes don't care. What Hermes does have going for him is the ability to turn off his personal gravity field, trading solid ground and stability for high-velocity bouncing action of inertia. He's an object in motion that stays in motion, at least if he wants to complete each level in the fastest time possible. Wouldn't want to disappoint those OpenFeint leaderboards. 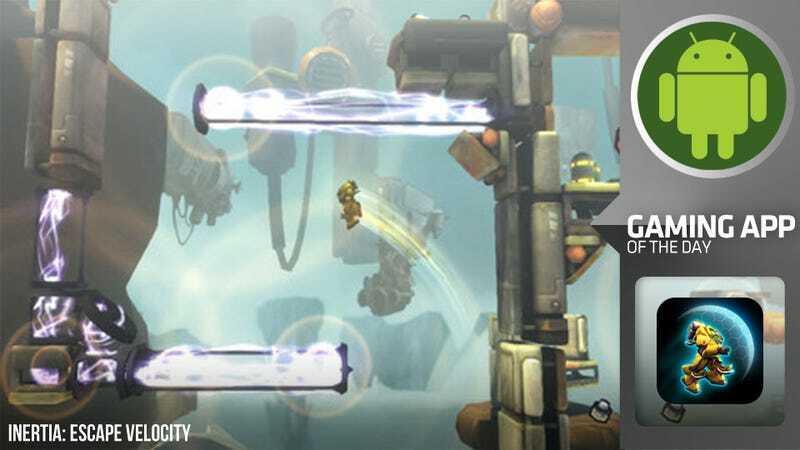 Luckily speed is easily achieved in Inertia once you get a handle on the game's unique controls and know how to wield your physics. Hitting the virtual jump button followed by the virtual inertia button will send you slowly floating upwards, but you know what's faster? Falling. Hit the inertia button while dropping and you'll bounce back up at plummeting speed. It's tactics like that you'll need to master as the game mixes more technology into Hermes' scrap hunt. Force fields require you hit them at high speed to break their hold, for instance. I'm still trying to get the hang of attractors and repulsors, two obstacles (of a sort) you'll come across that act pretty much as their name implies. The really nifty thing about Inertia: Escape Velocity is that every level, no matter how complicated and convoluted it may seem, is designed to be traversed ridiculously fast. At the end of each level you'll see the target time you need to beat to earn a medal, and it will surprise you. A level that took you three minutes to traverse might have a time target of 45 seconds. How do you get through it that fast? Well that's the challenge, isn't it? Most of all, Inertia: Escape Velocity is a shining example of what the little guy can accomplish in today's indie-friendly video game market. From student project to $100,000 award winner to the Android (and iOS) game everyone will be talking playing as soon as they finish reading this article. Note: I tested out the HD version of the game on the Kindle Fire, and it worked rather well, though Amazon doesn't offer the game for the device. If ever there was a candidate for side loading, this is it.